Last night we were driving back from Portland (where we had Thanksgiving with my parents, which was very nice) when something tragic occurred. 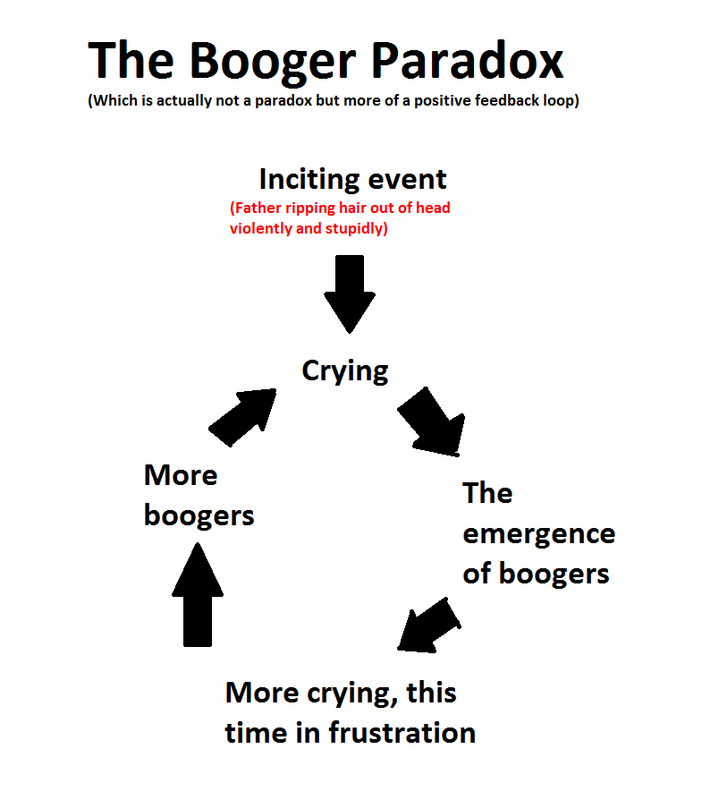 How did I initiate the Booger Paradox? I did it by being a man. A man who can’t do hair. And who physically assaults his daughter (not really. Please hang up with CPS and take a chill pill) thus making her bawl, thus causing boogers to come out of her nose which she finds really frustrating, which makes her cry more, which makes for more nose-running, which causes more crying, which causes more boogers, which causes even more crying… you see the paradox that’s actually a positive feedback loop here, right? It’s a vicious cycle of boogers and weeping. Allow me to explain what happened. Anna was in the back seat complaining that she couldn’t sleep because her ponytail prevented her from laying her head back comfortably. I offered to take it out of her hair for her because wife is driving. Now, if Wife had been the one resolving this issue, it would have been seamless. She would have reached back, magically caressed Anna’s head for a few moments, and Anna’s hair would have come cascading down around her face, ready to be comfortably slept on. Somehow, I got confused and forgot to factor in that I am not her, and indeed, possess a Y chromosome, thus rendering me incapable of such a feat, and also giving me the unfounded confidence that I could do this because, hey, I can do anything, right? I confidently reached back, one-handed, and after tugging and pulling for approximately thirty-seven hours, I succeeded in making her look like she’d put her finger in a light socket–not only in that her hair now resembled a blown-up hay bale covered in stray strands of unsuccessfully removed rubber band, but also because she was obviously in as much pain as if she actually had been electrocuted. Also, she was bawling. And it was really sad. As always: Father of The Century! I don’t know how I do it, but I seem to win this award every couple of days or so. What an honor! After begging her to let me try one more time, which she responded to by actually recoiling in fear even though she really wanted to trust me, I was finally able to remove the stray strands of rubber band I had gotten stuck all through her hair. Along with those pieces of rubber band came enough stray, broken hair to make a doll’s wig. I was not thanked for my efforts. Which is good, because more than anything I felt the urge to punch myself in the face. Anyway, as an unfortunate byproduct of my actions, Anna’s nose started running. So I got her a tissue. Then Anna started getting frustrated because her nose wouldn’t stop running. This frustration led to crying. Which led to more boogers. Which led to further frustrated tears. Then more boogers… you get the point. (Side note: Anna’s never been able to blow her nose. She does learn new things every day, so I thought maybe nose-blowing was something they’d taught her in pre-school. You know, for her and all those other kids who also can’t exhale forcefully out of their nostrils on command. 1. I need to keep my freaking man hands to myself. Especially when it comes to hair. 2. I need to research how to teach the skill of nose-blowing. 3. I need to not be a jerk about the Booger Paradox. Especially when I caused the inciting event. 4. I deserve a prize for parenting. Clearly. Eventually, as it turns out, my feeble and embarrassing efforts paid off. Anna was able to lay her head back and sleep soundly. And thus the cycle was stopped. Can't wait to read about you teaching her how to ride a bike. Lol. You probably taught your daughter an important lesson…and that is to just deal with the ponytail in the first place and leave daddy alone. I have the same problem with our baby. When we try to wipe her nose, she acts like we're trying to rip her face off. And now it's winter so she always has a runny nose. She's become one of those kids with constant crustiness because I'd rather just leave it than have nose-wiping turn into a major goo-fest. @Onedia–Yeeeeah. That should be pretty awesome. Ha! @Christine–Interesting point. I'll have to mull that one over for a minute. Perhaps this is something to really consider… oh, no. Am I an ENABLER??? @FoxyJ–Exactly! It's really kind of dramatic. I never knew the difference between a paradox and a positive feedback loop. You think in this case it would be a negative-positive feedback loop. I have failed in all my many attempts to teach my children to blow their nose. So, take whatever comfort you can from the fact that you are not alone. Boogers are a way of life for us. Thanks for joining my blog! I have ADD too, so it's really really exciting to see a whole blog on the topic! All I have to say is girls are something else, aren't they? I have an 8 year old girl and two boys ages 5 and almost 4. My girl is like having 4 additional kids. She didn't stop crying over her hair being brushed until she was in 2nd grade. Finally I gave up and made her do it all herself or look silly at school. Now she does her own hair. Having a daughter who can do her own hair (pony tails, clips, hairspray, combing, etc.) is like having your last child grow out of diapers, I know because I achieved that last year. Good luck to you and your daughter. This was hilarious. I would comment on the nose blowing thing but I don't remember having too many issues with that one, but I have plenty of others so don't go and get all hateful and jealous. Lol! I am still hung up on the statistic that 67% of us don't mind the paradox term… I have searched the internet for hours and can not find this statistic anywhere! ok, not really, but I like the fact that throwing in a statistic makes everything sound official. DON'T read this post or you will feel REALLY bad! Joshua, I am beyond pleased that I have discovered this blog. My life is better. This post is hilarious! I have a 5-year-old daughter and doing her hair is a NIGHTMARE! As it turns out, if I even look at her hair she screams. If my husband brushes her hair, no problem – I don't get it! It's not like I beat her with the brush! As for the nose blowing…my youngest (nearly 3) CAN blow his nose but refuses and acts as if I'm beating him every time I try to wipe them from his cute little face. You'd think he would want me to remove the boogers, right?! I just don't understand kids reasoning sometimes! @Coach–(At first I just typed "couch" which would also be a nice handle.) Yeah, I do take comfort that I'm not alone. @Erica–Thanks! The blog has actually kind of left ADHD stuff in the dust and morphed into a place where I joke around constantly, but there is certainly a lot of stuff under the ADHD-I tag if you're interested. @Katie–It's really funny you pointed that out because initially I had a little footnote that said something like "Yes The Weed makes up most of his statistics. However they have been shown to be correct 93% of the time." Also, your post makes me all kinds of jealous! @Mary–My life is better as well knowing that you have discovered this blog. Fo realz.